Atlanta arts and community advocate, WonderRoot, teamed up with nationally renowned contemporary dance company GloATL to host a joint fundraising celebration which took place on March 24, 2012, at The W Atlanta in Midtown Atlanta. The event, Wonderglo, was created to benefit the artistic and educational endeavors of both organizations and included a total immersive artistic experience. Over the course of the evening, 1,250 guests experienced art, sound, and performances. The first wave of guests (approximately 275) arrived to a seated dinner in which they experienced and interacted with a 44 sculptural table installation which I designed and created with the help of many volunteers in a donated space at the Goat Farm Art Center. Created from salvaged wood from the historic Goat Farm grounds, historic neighborhoods of Atlanta, and a dismantled set from the Atlanta Symphony Orchestra. 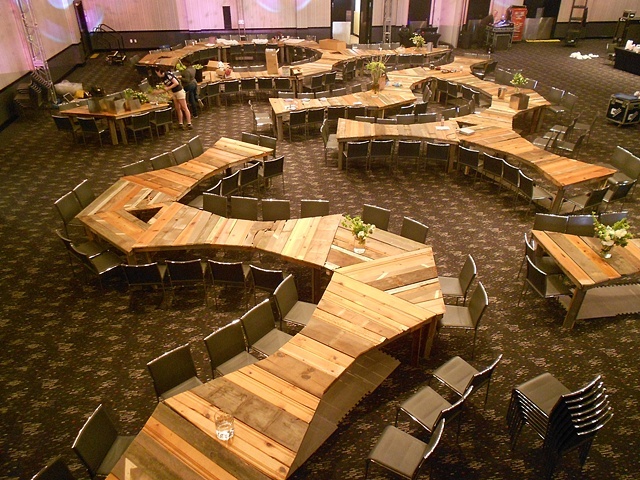 The design of the table was intended to break the standard layout of a formal seated dinner by creating tables that created a serpentine layout while offering diners unique angles and viewpoints. During the dinner GloATL dancers performed with and in the tables at key points in the installation.